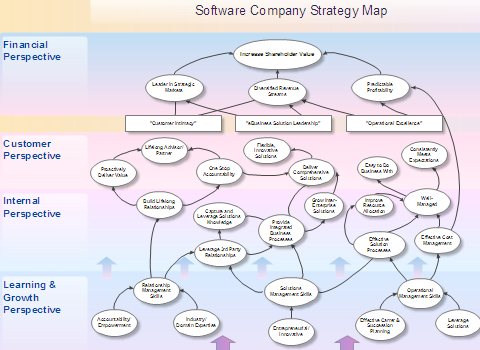 Review: This is a very basic strategy map, covering most fundamental and core objective of any software based companies. It is based on the base 4 balance scorecards and covers all the goals which are related to the improvement of software companies. All the objectives are strongly coupled and strong relationship exists in objectives within the same category and objectives across different categories. Useful for small scale software companies. Opportunities: This strategy map can be adopted and modified by small to medium scale software companies. Technical manager can modify this map to fit their objectives or modify their objective to fit this map. The map is useful either ways in aiding software organization to achieve the overall goal of the company. Result: A straight forward strategy map with no complexities involved can be considered good overall. The objectives are strongly related to each other and their relation can be easily comprehended without much effort. A drawback of the map is its excessive simplicity which hampers it’s a chances of being used In large scale organizations. This entry was posted in Reviews on July 26, 2013 by Strategy Map Expert. We are reviewing the best strategy maps, giving out some ideas that you can use for your own business. For more details check out Reviews of Strategy map category. Check out 10 best practice ideas for strategy maps. What is a strategy map? In short, it is a visual representation of where your company wants to be in the next few years. Sounds simple, but how do you do it? Well, it depends on how you ultimately plan to use it. Let's discuss some applications of a strategy map, depending on your goals. If your goal is to formulate your thoughts, you can just use a pen and paper to write down your strategy map. 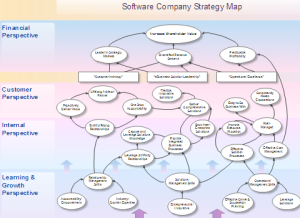 However, if you need to link your strategy map to indicators within your Balanced Scorecard, your best choice is to use software like BSC Designer. BSC Designer can automate the drawing process and give you enough tools for your creatives approach. It's no secret, sometimes you need to put together a great presentation about your strategy for stake-holders or the press. In this case, using professional Strategy Map Templates will save you hours. Sound interesting? Order your copy of Strategy Maps right now.